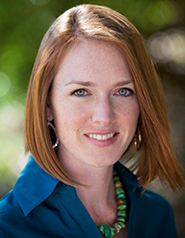 Who’s Who of Employee Engagement? 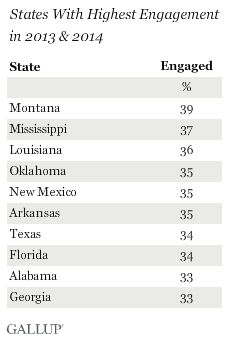 The states with the highest engagement are: Montana, Mississippi and Louisiana, each with 4-7% higher engagement than the current national average. Meanwhile those with the lowest are District of Columbia, New York, Minnesota and Connecticut, all of which have at least 3% more actively disengaged employees than the national average. Employees with a college degree have lower engagement than do workers whose education level doesn’t exceed a high school diploma. According to Gallup, this indicates that employers aren’t maximizing their investment in these more highly educated employees. How can we engage those who invested their time and money into time at a university? One solution is – look at their strengths. Furthermore, employees are the most engaged in their first six months of work, or once at the executive level, after ten years of work. What matters here is that organizations make the effort to keep employees in their “honeymoon” engagement level. New employees are excited to come to work, they’re learning new things, and making new connections in the organization. Can’t we replicate that for our more tenured folks? 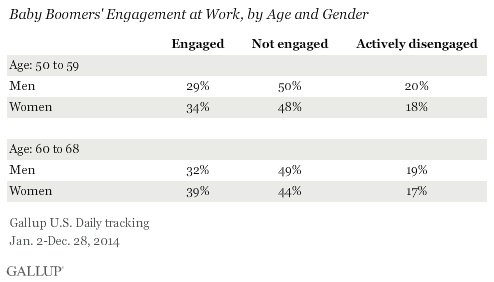 Another interesting finding from Gallup’s more recent data is that the Millennial generation are the least engaged. While they are currently the least numerous in the American workplace, they will soon be the largest percentage of our population due to sheer numbers. With Baby Boomers eligible for retirement we will see a dramatic increase in the percentage of Millennials in the workforce – this will cause a shift from the highest percentage of the workforce being the most tenured to the least tenured immediately, as Generation Xers are much fewer in population. Our question here should be: are Millennials not engaged because they’re simply the youngest and the least experienced, or perhaps the least loyal? Or it could be due to the results from another Gallup survey reporting that Millenials’ strengths are not being harnessed on a daily basis. What can you do to manage your Millennials differently knowing this information? One of the most interesting groups to note is that managers are the most actively engaged employees in the American workplace. What is it that managers have at the middle level of the organization that those higher and lower do not? My thought is that managers have a prime seat to understand the mission, vision, and values of an organization and to have the gratification of seeing their efforts, delegation, development, and coaching achieving the big picture. There’s no one right way to engage everyone — no one-size-fits-all approach. Every employee has his or her own learning style, communication style, appreciation style, personality, background, strengths, opportunities for growth, hang-ups, and preferences. Get to know your folks. The better you know them, the better you’ll engage them. The more you engage them, the more productive your team will be! And remember, engagement = a special kind of happiness! We can all use more happy in our lives! Soon, we’ll look together at drivers of employee engagement, which will perhaps shed some more light on things. Until we meet again, check out this video made by my Managing Director, Krisa Delacruz, on employee engagement! How are the great things accomplished? Not from carrots and sticks. Passion and purpose scale—always have, always will. Every movement, every revolution, is proof of this fact. Plus, doing anything big and bold is difficult, and at two in the morning for the fifth night in a row, when you need to keep going, you’re only going to fuel yourself from deep within. You’re not going to push ahead when it’s someone else’s mission. It needs to be yours. 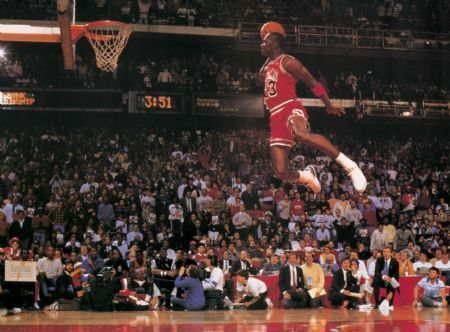 In 1995, after Jordan returned to basketball from his year-and-a-half-long baseball sabbatical, he spent the summer in Hollywood making the movie “Space Jam,” but he demanded that the producers build a basketball court where he could work out every day. you’re only going to fuel yourself from deep within. So, what motivates you – where do you find your motivation? That reveals so very much, doesn’t it? This dress shut-down my social media accounts for two days. I just could not take any more comments about the dress. Blue and black? White and Gold? Or, if you’re an oddity, like me, you see brown and light blue. Seriously, how could a simple picture of a dress go viral? Maybe, the better question is why are different people seeing different colors? According to the New York Times, the dress was worn by a mother of the bride during a wedding in Scotland. Obvious in person as blue and black, a photograph that the mother sent to her daughter a week before the wedding received a different response as to the colors with everyone that viewed it. Still intrigued by the color differences after the wedding, a member of the wedding band then posted the picture to her Tumblr account and asked for feedback on the colors of the dress. 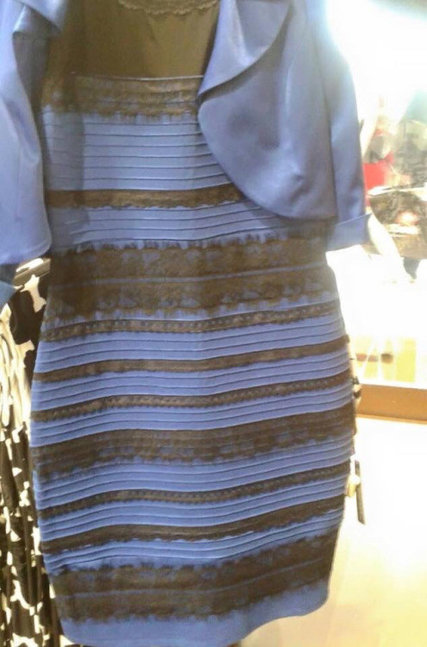 Within hours, the photograph of the dress and polls were viral. Millions upon millions of people commented on the viral phenomenon, which has been nicknamed “Dressgate.” Everyone saw a different combination of colors. Scientists have differing opinions on exactly why there are different color combinations seen. The answer likely lies in how our eyes process visual information and discounts color. Our brain uses the primary colors to determine a dominant response for the visual color that we view, in conjunction with other factors such as material, light, and the sensor in the camera (since the color discrepancy only appears in the photograph). In this case, there is not a clear dominant response for the color, which is then interpreted differently by different individuals. Oddly enough, this social media phenomenon reminded me of an important lesson that I learned in graduate school from one of the top public administration professors (way before social media existed!). In class, John Nalbandian walked us through a case study for a community where an apartment building consisting primarily of senior citizens requested a crosswalk so they could safely cross the street to reach a Dairy Queen and a church. In a brief summary, the staff told the appointed/elected officials that a crosswalk was not warranted in that area. The residents were upset with the recommendation and after further discussion, it was realized that the request was not really about safety for crossing the street as much as it was about dignity and mobility. During my studies, I was taught that in local government, “2 + 2 does not always equal 4.” In the case of the crosswalk, the staff looked at traffic counts and believed that a crosswalk would impede traffic flow when it seemed very safe for those to cross this street safely. When looking at the exact same issue, the senior citizens saw a change to improve their mobility and in turn maintain their dignity. When determining local government policy, there are times when there is not a clear, dominate response and the same issue can be seen differently by different people. It is the responsibility of our leaders to realize that 2 + 2 may not always equal 4 – it is our responsibility to help process the information to determine the best option for our community. We instinctively know people are happier when they are engaged. (We aren’t referring to those who are engaged to be married, although admittedly that’s typically a blissful group.) Common sense, coupled with years of research, tells us that people who are engaged in their work are happier, healthier, more dependable, more productive and more positive. know someone and take note of his or her special traits and talents, you find out what s/he enjoys, and you spend time in those activities that make him or her happy. In the workplace, you get to know your employees, learn what their strengths are, and to the degree that you can, you assign projects that utilize those abilities. You observe your employees, help them discover their natural talents, and develop those strengths rather than focusing on weaknesses. If a weakness is due to a lack of experience or training, then improvement will come with time and instruction. If a weakness is due to a lack of natural talent in that area, to continue to focus on it drains the employee of his or her energy and confidence. So how can you identify your employees’ natural talents? What do they learn quickly? Which assignments do they seem to enjoy doing and do well? Is there excitement in her voice when she talks about the project? Or does he keep procrastinating on a particular type of assignment? Some organizations utilize profiles such as the StrengthsFinder profile developed by the Gallup International Research and Education Center to identify the natural talents of their employees. One city department recently participated in an assessment to determine strengths, then created an Excel spreadsheet that listed all of the employees with a mark indicating their strengths. They learned that their team included such a variety of strengths, they had them all covered! And they created a visual system to quickly identify which employee has specific strengths. Can you imagine what a great tool that would be for a manager who is deciding project assignments? What about the job satisfaction for the employee who is spending the majority of the work day matched to projects where s/he excels? How much more happy and engaged would employees be if they were able to work on projects they naturally enjoy, are energized by, and where they have the opportunity to further develop their talents? What if you are the unhappy, disengaged employee seeking a new job? What steps can you take to make sure you are a good match for a potential position? Identify your strengths through a profile like the one mentioned above, or through your own observation of when you enjoy and excel on specific aspects of work. Sometimes a colleague can help you see where you seem to naturally thrive and shine. When you pre pare your resume, don’t just list your current and past job responsibilities. 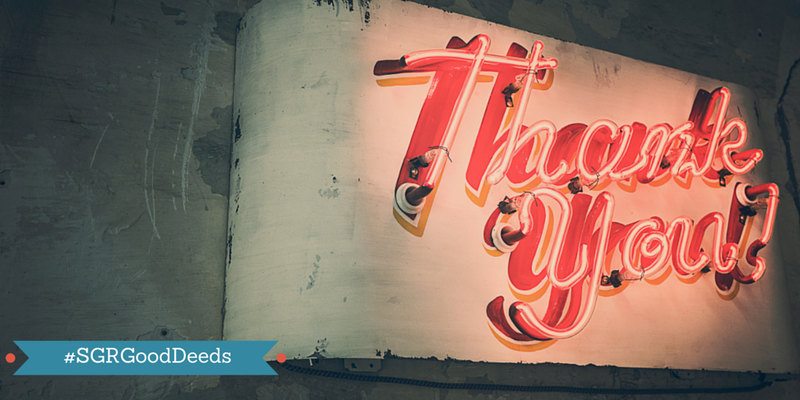 List the specific parts of the job that best utilized your strengths and that you enjoyed. If you were responsible for compiling data into a monthly report but you dreaded it and felt your energy drained when you worked on it, don’t list that on your resume. Market yourself for the position that is the best match of your strengths, natural talents, and abilities. When you interview, ask questions to determine the requirements of the job with your strengths in mind. The new position should be a great marriage of your talents, qualifications, and strengths with the primary responsibilities of the job. Matchmaking in the workplace? It’s a concept that can definitely be espoused! a feeling of trust in one’s abilities, qualities, and judgment. Besides which you see I have confidence in me! There is a lot of discussion about “self-confidence” going on — kind of continually. (Here’s a recent Fast Company article about women and self-confidence). But, when it comes to speaking, this can be a real killer problem. A speaker has to come across with brimming self-confidence; a speaker has to look and sound like he/she is full of confidence. In other words, yes, it is quite a challenge to actually become more self-confident. But, when you are speaking, you need to sound confident, whether you are self-confident or not. But many speakers come across as tentative, unsure, not quite sounding certain of what they say. Now, if they haven’t done their homework, and aren’t prepared, then it is kind of hopeless to begin with. But if a speaker has done his/her homework, and is prepared, then add the step of sounding more confident to your rehearsal time. When you speak, stand up straight! Poor posture comes across as lacking in confidence. Literally, work on your posture — practice good posture. Speak making assertions, rather than sounding like you are questioning your own thoughts. Speak more “forcefully” – don’t sound tentative. And one secret is to avoid rising intonation – making a statement in a way that sounds like you are asking a question. When you rehearse, record your rehearsal. (Just set up your SmartPhone, and record yourself). First, watch yourself carefully – without the sound on at all. How’s your posture? Do your facial expressions make it look like you know what you are talking about – that you are not questioning yourself? And then, watch yourself again, with the sound on. Does your voice sound confident, or unsure and tentative? Watch; listen; make tweaks, rehearse again. Keep at it. Being confident is great. But, even if you are not there yet, appearing and sounding confident is critical. It is worth working on pretty diligently. Girl and Boy attend the same graduate school. Girl and Boy only communicate on an “as needed basis.” Girl and Boy are invited to interview out-of-state with the same local government. Girl and Boy are forced to communicate and suddenly realize they share a lot of the same core values. Girl and Boy live happily ever after. While this is a major summarization of our relationship, the point is that my husband and I share the same core values. Not unlike others, a large number of people in service industries, such as local government, chose a partner who is either also in government or a like service-related industry (education, medical, social services, etc). I believe that is because (generally speaking) service is a core value to those in government and those with a passion to serve look for others to serve with them. What words best describe our family? What is most important to our family? What are our strengths as a family? What sayings best capture our family? Just as we discussed last week, when difficulties arise, your core values can guide your organization…and your family. Whether you are a family of one or twenty, traditional or non-traditional, consider gathering those that comprise your family unit and discuss what it means to be your family. Then, further define those answers into family core values. When difficult times arise from the toddler tantrums, complexities of teenagers, or the stress of finances, careers, and marriage, you can turn to your core values to be your guide. 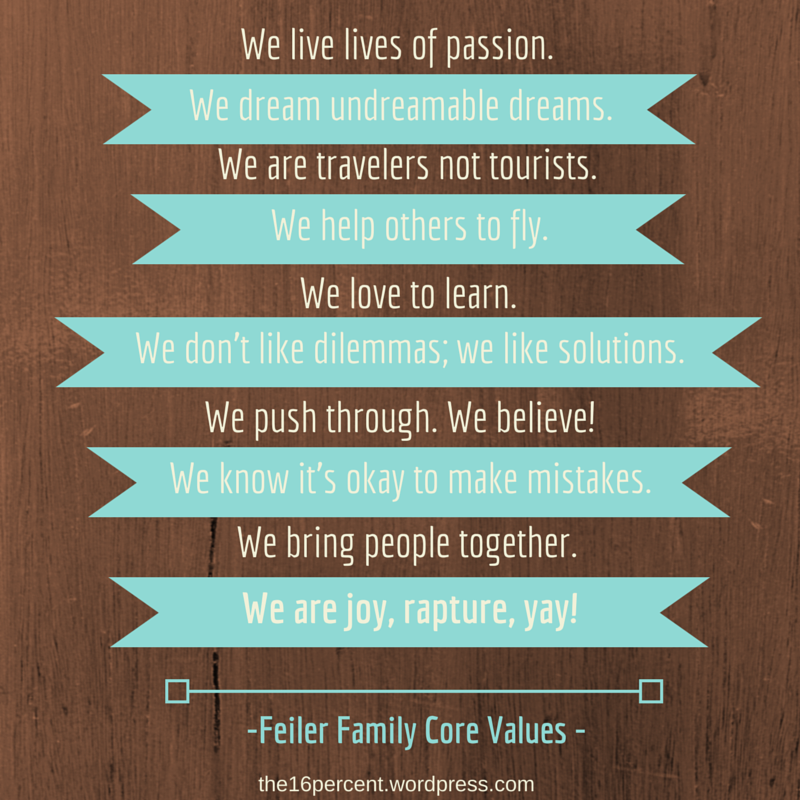 In closing, read through the Feiler Family Core Values – I hope they inspire you to consider leading at home as you do in your organization and develop family core values. Have you seen this video? It has been making the rounds and, recently, SGR featured it in our weekly 10 in 10 Update. I’m sure most of you reading this, especially those of you who are regular Facebook users, have witnessed the phenomenon outlined in this video—from viral videos to cat memes, information can spread like a communicable disease. Unfortunately misinformation can spread just as rapidly. While funny memes and Buzzfeed articles are more entertaining than harmful, misinformation can be extremely harmful. Sometimes the people spreading these “mental sneezes,” and the ones catching them, don’t realize this. One of the great challenges we are faced with in the Information Age, is how to distinguish the factual, evidence-based information from the misinformation. If you are a frequent Facebooker or Googler, this can be a daunting task due to the speed at which misinformation travels and the speed with which search engines may be integrating our personal biases and habits with their filtering. A while back, I read a book called The Filter Bubble. This book discusses the inner workings of internet filters and reveals the ways in which they can potentially promote bias and threaten rational discourse. In the book, the searches of two women are compared. Both Googled the term “BP” (as in, the oil company). The results Google returned were very different for each. One got results that were mostly about the BP oil spill, the other got mostly investment information about the company. These women had similar backgrounds and similar political beliefs. Google was primed to retrieve results based on their previous search habits. Considering these factors, you may suspect that people with drastically different political views and backgrounds would retrieve drastically different results when conducting identical searches. What this suggests is that those great algorithms that help Google and Facebook determine what kinds of food and clothing we like (based on our previous habits) and target ads accordingly, are also determining the seemingly reliable information that is served up to us every time we do a search. In other words, Google is in your head and it knows what you want to hear. Sometimes this is good thing. We want the information we want to be delivered as quickly as possible, right? The problem is, of course, it isn’t always reliable information. And this can be bad because, even if it isn’t reliable, we are still willing to accept it as reliable if it confirms our previously held notions. We tend to seek out information that makes us feel validated. And then we tend to post that information on Facebook or Reddit and argue about it for hours—even days—on end because even the arguing reinforces our belief in the opinion-confirming information. We change our beliefs, behaviors, and/or opinions (but not usually). We try to justify the belief, behavior, and/or opinion by altering the conflicting information so that it is a better fit with what we already think and feel. We try to justify beliefs, behaviors, and/or opinions by adding new ideas that make us feel better about what we already think and feel. We decide to ignore any new conflicting information that would call our beliefs, behaviors, and/or opinions into question. As we learned from Randy’s blog on Monday, bad decisions are often made in groups. Herd mentality can ensure that bad decisions have a bigger impact, that mistakes are more difficult to correct, and that misinformation spreads faster. In order to make better decisions, we need to be well-informed; we need to be receptive to new information, even when it conflicts with our opinions and beliefs, and learn to spot harmful misinformation so that we don’t spread it. Next week, we’ll discuss some practices that can help us do this. Last week, I challenged you to join me in doing 15 good deeds. This past Sunday was Good Deeds Day, a worldwide movement of 900,000 volunteers in 58 countries who take part in a celebration of “doing good.” Several of you joined me, and I thank you! A meal was pre-paid at a burger joint for a future customer. Fresh cookies were left at neighbors’ doors. Many attempts at being kinder drivers occurred. A lot of patience and waving, and one more extra car being let in, in traffic took place! A Pay-It-Forward chain was started and sustained (in case one car accepted the kind act but didn’t pay it forward) at a coffee shop drive-through known for kindness, called On The Grind Coffee, owned by Mark Parmerlee. Mark and his employees epitomize extraordinary customer service, and they have seen customers take it upon themselves to frequently and spontaneously participate in pay-it-forward chains. 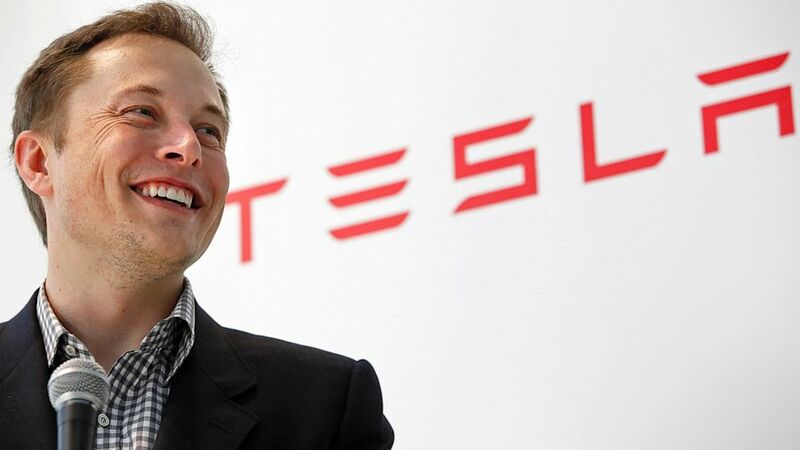 Kudos to you, Mark, for inspiring your customers to do good. 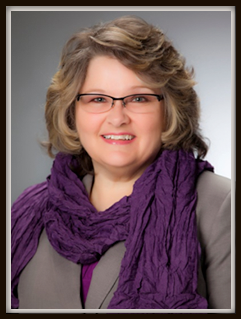 You make New Braunfels a better place! Shared a treat and watched a movie on a shared iPad with a seatmate on a flight. Picked up a woman’s tab at a restaurant – she had the five most well-behaved children (ages 7 and under) on record, ever, in the history of dining – she deserved that and a medal. Chocolate and banana bread delivered to office mates. Surprised a friend with coffee. Let a man with flowers and a card ahead of me in line to check out at a store. When he declined the offer, I said, “You look like you have somewhere to be.” He smiled and went ahead. Promoted and donated to friends’ fundraising efforts for American Heart Association and Walk for Multiple Sclerosis. Helped an older woman without her glasses operate the microwave at the hotel. I hope that, as you do good deeds, you find them to not be cumbersome, expensive, or uncomfortable. I hope that you find them to be quietly gratifying, that they bring you a sense of peace, even. And that they become natural-feeling, part of who you are. While you and your employees may not have had the benefit of being raised by public servants, you can begin instilling these traits and encouraging these acts now! You’ll make someone’s day, encourage better customer service, even help someone’s life. I challenge you to continue doing good deeds. If you want to encourage others to join you, please continue using the tag when you post #SGRGoodDeeds. Thanks again for joining me. It makes me happy! 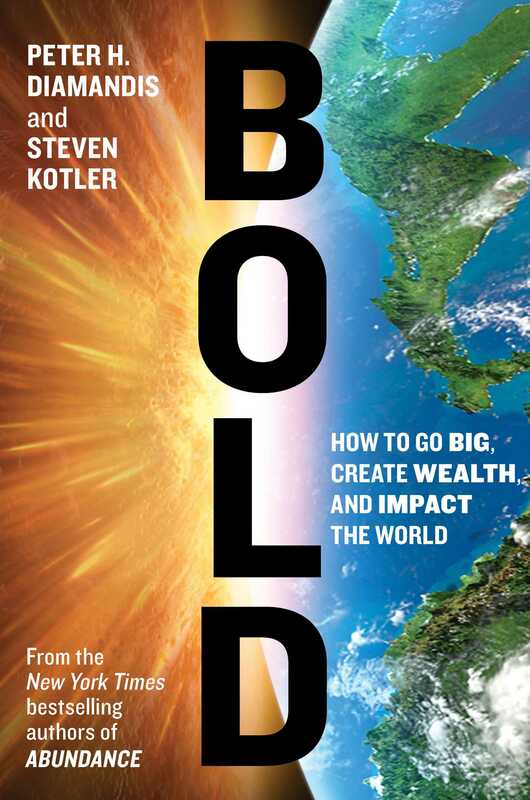 …happy talk is a principal target of this book. The good news is that if discussion is properly structured and if groups adopt the right norms and practices, they can create that culture. The bad news is that in the real world, discussion often leads people in the wrong directions. Many groups fail to correct the mistakes of their members. From the Bay of Pigs, to Iraq War decisions, to countless “bad calls” in companies and organizations, groups frequently demonstrate unwise decision-making abilities. The book Wiser is a book to help us be smarter – “wiser” — about our group and team decision-making. And this is something we need to get much better at because we move forward when people work well together. Groups and teams, working well, are at the heart of every success story. And group failure seems to be behind plenty of the “failure stories” around us. #1 — Groups do not merely fail to correct the errors of their members; they actually amplify those errors. #2 — Groups fall victim to cascade effects, as group members follow the statements and actions of those who spoke or acted first, even if those statements and actions lead the group in unfortunate, terrible, or tragic directions. • A cascade occurs when people influence one another, so much so that participants ignore their private knowledge and rely instead on the publicly stated judgments of others. Corresponding to our two accounts of social influences, there are two kinds of cascades: informational and reputational. In informational cascades, people silence themselves out of respect for the information conveyed by others. In reputational cascades, people silence themselves too…The central point is that those involved in a cascade do not reveal all that they know. As a result, the group does not obtain important information, and it often decides badly. #3 — Groups become more polarized, ending up in more extreme positions in line with the predeliberation tendencies of their members—such as when a group of people, inclined toward excessive optimism, becomes still more optimistic as a result of internal discussions. #4 — Groups focus on shared information—what everybody knows already—at the expense of unshared information and thus fail to obtain the benefit of critical and perhaps troubling information that one or a few people have. Groups have a lot of ways they can go wrong. Bosses, and true influencers, need to speak last! It is so easy to do/to get things wrong, and so hard to do/to get things right. (Maybe, getting things wrong comes naturally; you have to really work to get things right). If you disagree, SPEAK UP with your disagreement! It is imperative that groups have contrarian voices – voices that disagree. Otherwise, groupthink at its worst will win. 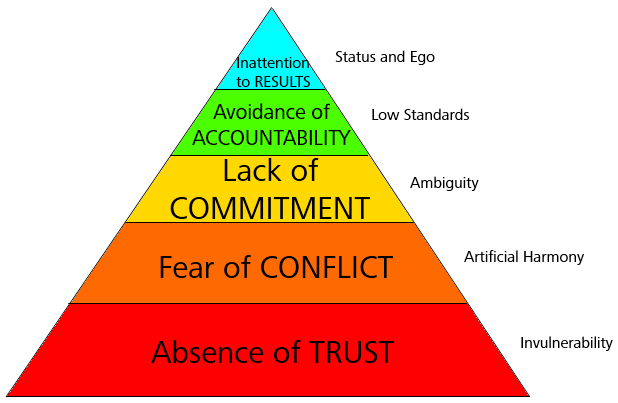 If you work with groups (and, you do), I recommend that you look closely at two books: The first is the “group/team classic,” The Five Dysfunctions of a Team by Patrick Lencioni. 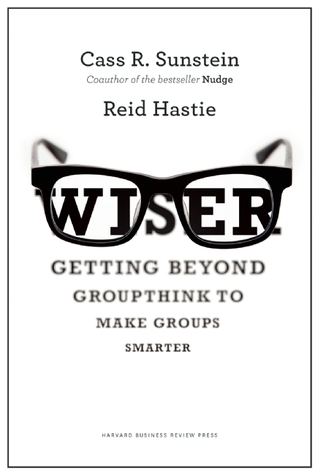 The second is this book, Wiser: Getting Beyond Groupthink to Make Groups Smarter by Cass R. Sunstein and Reid Hastie. Our synopses, with our multi-page, comprehensive handouts, and the audio recordings of our presentations, are available at our companion site, 15minutebusinessbooks.com. My synopsis of Wiser will be available on our site soon. Core values can be seen as something that is nice to have; however, when difficulties arise, your core values can guide your organization. This week, a University of Oklahoma fraternity created a video where students were heard chanting racial slurs that refer to the African American community and vowing to never admit them to Sigma Alpha Epsilon. The video demonstrates repulsive behavior and thought. To those who have misused their free speech in such a reprehensible way, I have a message for you. You are disgraceful. You have violated all that we stand for. You should not have the privilege of calling yourselves “Sooners.” Real Sooners are not racist. Real Sooners are not bigots. 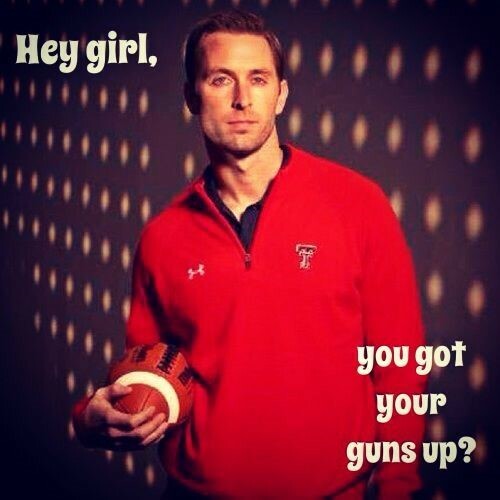 Real Sooners believe in equal opportunity. Real Sooners treat all people with respect. Real Sooners love each other and take care of each other like family members. Effective immediately, all ties and affiliations between this University and the local SAE chapter are hereby severed. I direct that the house be closed and that members will remove their personal belongings from the house by midnight tomorrow. Those needing to make special arrangements for possessions shall contact the Dean of Students. All of us will redouble our efforts to create the strongest sense of family and community. We vow that we will be an example to the entire country of how to deal with this issue. There must be zero tolerance for racism everywhere in our nation. Impressively direct, President Boren outlined his disgrace for the situation, a remedy, and a long-term solution for correcting the problem in the community. The detailed description for OU’s Integrity core value is: We do the right things for the right reasons. President Boren did that this week. The University of Oklahoma quickly responded to the crisis that the viral video created. Hopefully, they will also follow-through with the long-term goal of instilling these values throughout their community so that the behaviors exhibited in the video do not occur in the first place. When you find yourself leading in a time that your core values are challenged – let the values be your guide. (Tweet This) Do the right things for the right reasons.